Marketing is a crucial element for any business, and this is especially true for your dental office. In general, you will need to see 24-50 new patients each month if you want your practice to grow. This number will vary based on the size of your practice, your location, and other variables, but regardless of the exact number, you will need to implement marketing ideas to engage with prospective patients. You could have the best staff and the best prices in town, but if you are not able to get found and book more appointment, then your practice won’t be able to grow. Along with competitive prices and quality services, you can use a few marketing strategies to drive more qualified leads to your office and turn potential patients to regular income today! Your dental practice is likely located at a physical location in your city, and this means that you can use local SEO to your advantage. Local SEO is a strategy for dental marketing that packs a HUGE punch for your dental office because it is relatively inexpensive to implement and maintain. While local SEO is cheap compared to other marketing channels, it will require you to focus on consistency and do a lot of manual work to get listed on relevant directories. This localized marketing strategy that focuses on getting your office found in Google’s Local Pack. Local SEO is a powerful internet marketing strategy because it is focused on the intent and location of your audience. 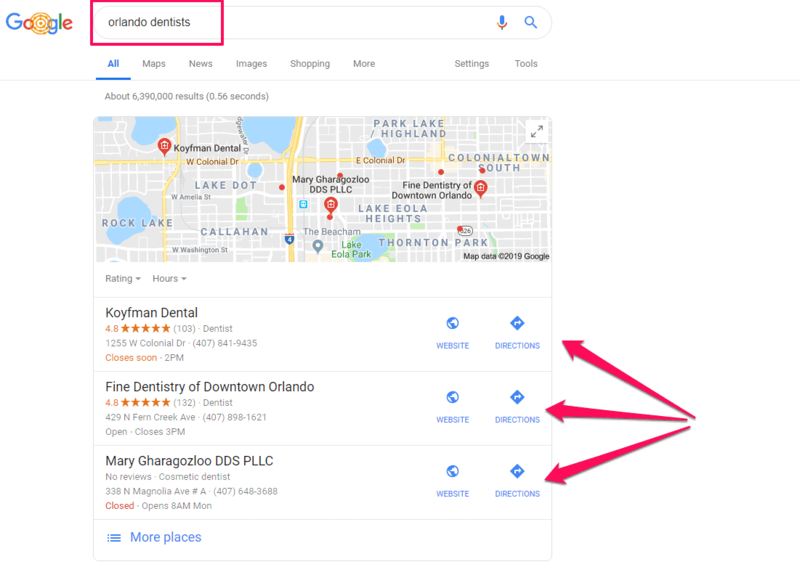 Google and other search engines use advanced Artificial Intelligence to show local SEO listings to people searching who show “local intent” so their results will display local companies like your dental office. Local SEO is a great online marketing tactic for your dental office because it can help you claim more real estate on mobile devices, plus your potential patients are likely looking for a dental office close to them, so you need to get found by search engines in your community. If you are looking to claim online visibility with dental internet marketing, then you should look to local SEO for location-based search. Local SEO requires you to pay special attention to several pieces of information called NAP (Name, Address, Phone Number), and you need to make sure that NAP information is precisely the same across all local citations and directories. Your business category (should be “dentist” or “dental clinic”). A complete description of your business. Local SEO is a powerful part of your marketing efforts because it is a relatively inexpensive part of a dental marketing plan that can yield great results. You can use one of our free marketing templates to help you keep information consistent across the Internet and track which directories you are listed on. Be sure to put a few hours into local SEO as part of your strategy each week if you want to drive more local patients to your office today! Google Ads is a powerful online marketing strategy for dental offices because you can control what and where an advertising message is seen by your target audience. PPC marketing is a proven piece of any dental marketing plan because you can optimize Google Ads to show to the right people at the right time to drive more patients to your office. While Pay-Per-Click is an excellent dental marketing idea, your team needs to make sure that you have a dental marketing company set up your Google Ads account and optimize your campaigns each month. Find the best dental marketing keywords. PPC marketing is an intent-based marketing channel because people have to type in specific keywords to get your ads found. You should only bid on dental keyword combinations that have low competition and highly profitable for your practice. Think about what sets you apart, and who will be searching for your services and base your keywords around the needs of potential patients to ensure you are found online. Optimize ad scheduling. An advanced option in Google Ads is to specify when your ads appear in search results. You should consider only displaying ads when your office is open so your team can take patient requests and book appointments on the spot. Call Only dental ads. You can use call only PPC ads to drive more calls to your office. This is a special type of ad where your readers can click on the ad and call your office phone number directly without having to go to your website or other online content. Great dentist Google Ads copywriting. You need to have great keywords to get your ads seen by the right people, but your Google Ads need to have great content if you want them to get clicked. You should use keywords in your ads and evoke emotional responses at the same time. Optimize your dental website landing pages. The job of PPC ads is to get clicked, and the role of your landing pages is to get the reader to take action. You should have your landing pages optimized with keywords, imaged, and strong Call-To-Actions to ensure you generate leads and book appointments once people click on your ads. Your office can use Google Ads and other PPC marketing strategies to attract more qualified leads to your site. Just make sure you use geo-targeting only to show your ads to people close to you and follow the above tips to make strong campaigns that will drive more results. If you are not sure on how to set up or manage a PPC account, then you should consider investing in a trusted PPC management company to help you make the most of your online marketing spend. Your office staff should collect information about your customers for excellent customer service, and you can apply this same approach to help your practice engage interested patients online. This is called remarketing, and you can use this marketing plan to grab readers who showed interest in your services but did not book an appointment. The basic idea of remarketing is that you can tag people who come to your dentistry site through Organic SEO, PPC, and other channels. You can target online ads to those people based on the pages, time on page, and other elements of specific visitors. Some remarketing ideas include Facebook remarketing and remarketing on the Google Display Network. Remarketing may sound like an odd marketing strategy, but the truth is that finding a dental office is tough for your patients when they move to a new city. Your website should specify what sets your practice apart to generate more leads, but sometimes people need more time to research before they choose to call your office. This is where remarketing comes into play since there is a lot of research that goes into selecting a dental practice. Remarketing is a vital part of your marketing plan because it allows even small dentist offices to narrow down who their ideal client is. You can remarket to specific visitors who did not book an appointment with you based on their location, content they viewed on your site, and other qualifiers. Your dental practice relies on getting found online and building a relationship with your audience before they trust you enough to call and book an appointment. This process can take some time from when they first find you when they schedule an appointment, so content marketing is a great way to get found online. Unlike other forms of advertising for your marketing plan, content marketing is all about offering valuable information to online searchers based on their need. This approach to marketing will help you rank in search engines, and you can build a strong relationship with potential patients as they see first-hand that you are the go-to for their dentistry needs. 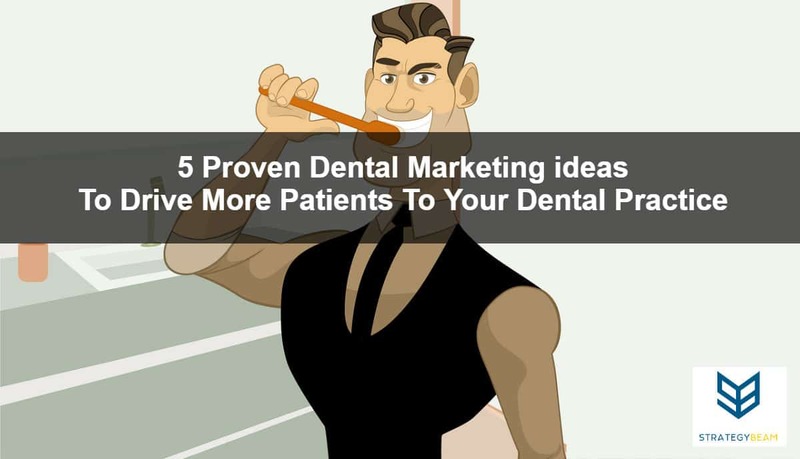 Here are some marketing ideas that you can use in your dental practice to get the attention of your ideal audience while also improving search engine optimization. Create how-to videos on YouTube that show patients how to take care of their teeth and general dental health. Write high-quality blog posts and articles that dive into the latest research about specific dental care practices that are important to your patients. The basis of content marketing is using the information to build a relationship with new patients. This is one of the best approaches for dental marketing because your content will address the real-world needs of your customers. If you are struggling to get started building content, then you can begin by noting the questions your patients often ask when they visit you. Once you have a list of items, you can organize and build out content to rank in search engines and drive new patients to schedule an appointment with you! At its core, your dental marketing strategy should focus on the needs of your customers and building a relationship with new patients. There is no better way to do this than to create an online community on social media networks like Facebook, Instagram, and Twitter. Social media marketing is a powerful approach to advertising even for a small practice. You can post before and after pictures, happy patients, and information about your training so interested patients can research you before they book an appointment. Social networks offer paid advertising options, and you can use Facebook ads for marketing to both prospects for new patients in your area and remarket to people who visited your site. Marketing on social media is a cost-effective approach to market your dental practice by targeting your specific audience. Another great way to drive more engagement on social media is to host a contest on Facebook where the winner will receive a free consultation with your office or other rewards. There are many marketing campaigns that your practice can run to attract new clients in your geographic area. These dental marketing ideas are relatively easy to implement and do not require substantial upfront investment. One thing to keep in mind though is that while these dental marketing strategies don’t seem too tricky, it can be complicated to implement the step-by-step details needed to get the most out of your marketing dollars. If you need to improve your dental practice’s online visibility and attract new patients, then you can use the above marketing ideas without having to hire an in-house marketer. Be sure to use these proven dental marketing tricks to build your practice and grow your client base today!